RESTORE & REPAIR THOSE “LOST” CAUSES! 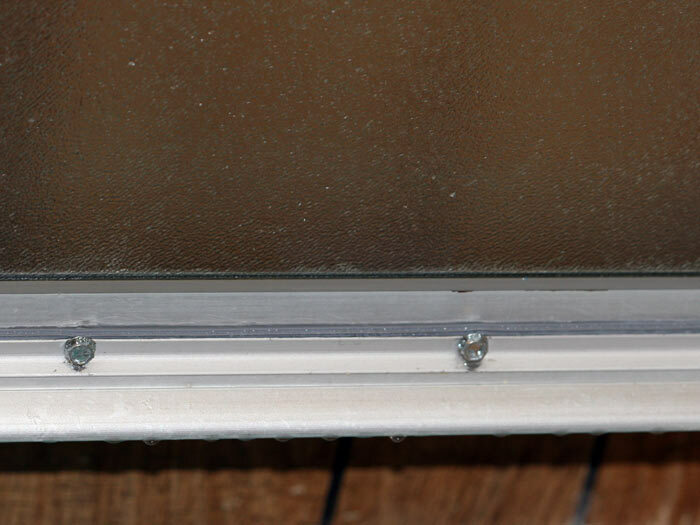 If you are getting puddles of water in front of you shower door, you might have a failing “sweep”. 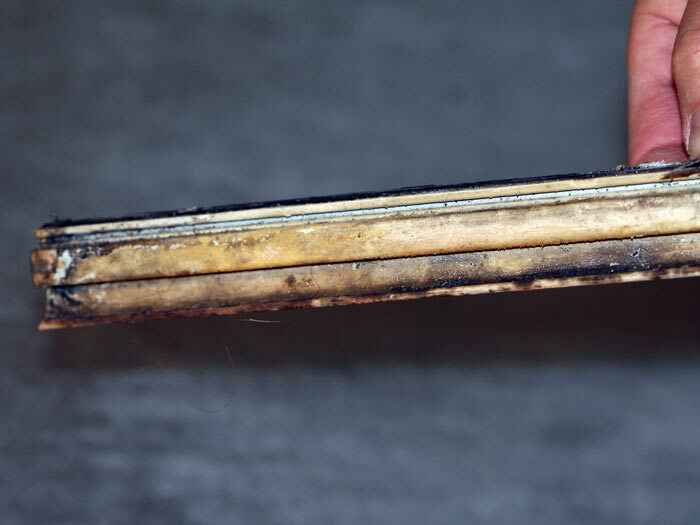 This is the vinyl strip that runs along the bottom of the shower door that sheds water back into the shower to drain. 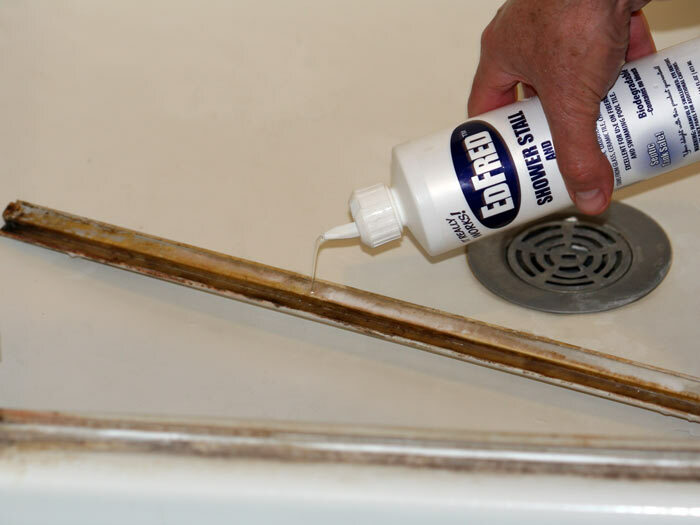 Any frequent puddling of water can damage your floor, so don’t delay in making this simple repair. There are several styles and methods of sweeps, so your method and replacement vinyl may be a bit different. If you measure and or save you old sweep you can take it in to the hardware store and get it matched. In this project we are working on a 4o year old mobile home bathroom. At first glance, it looked so bad that a new door seemed like the only option. The soap scum, lime deposits, water stains and rust from the old screws were as bad as it gets. 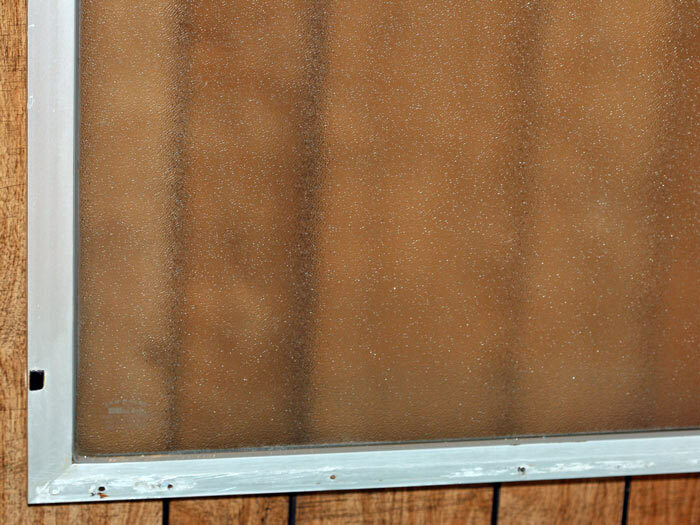 If a new replacement door could even be found it was likely to be expensive. 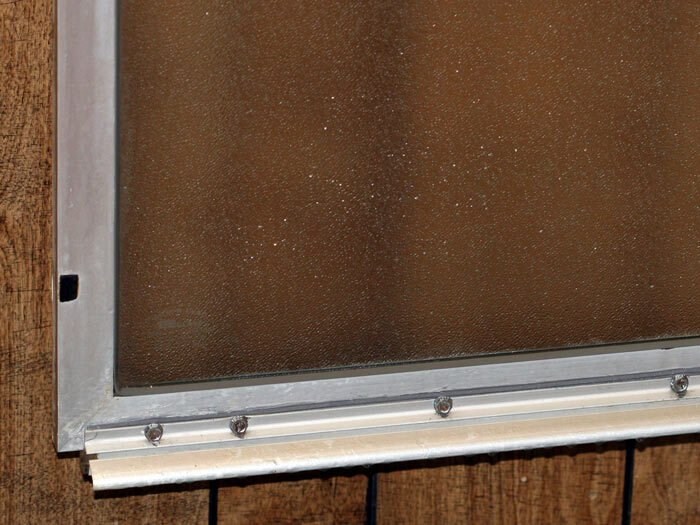 The door was a fairly typical aluminum frame and safety glass style. If we did not have the best shower stall cleaner on the market to work with, we would have threw up our hands and paid for that door. 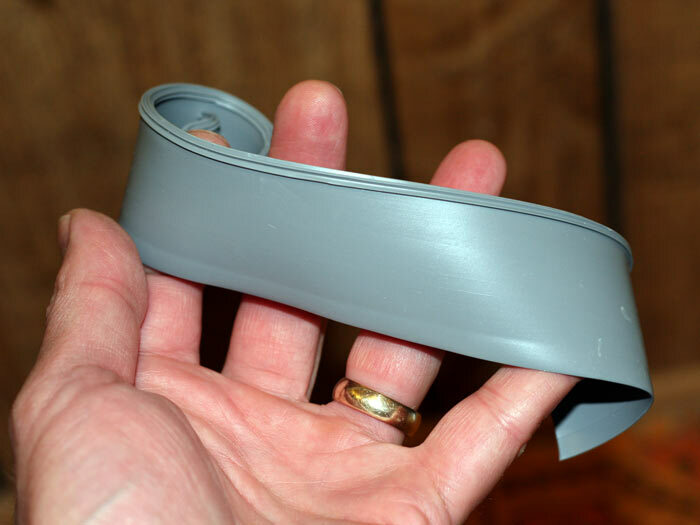 Parts: Vinyl sweep material (It is inexpensive, buy more than you need in case of a wrong cut), sheet metal screws. Step 1. Observe the door materials, and take a few measurements. The sweep may come apart when you remove it. Lay down on the floor and check how far down the original vinyl sweep comes down below the door. If bottom has torn off, plan on closing the gap at the bottom of the door and the frame. You can’t see the vinyl strip but it is under this drip rail. Gross, huh? Stay with us, there is a happy ending! Step 2. 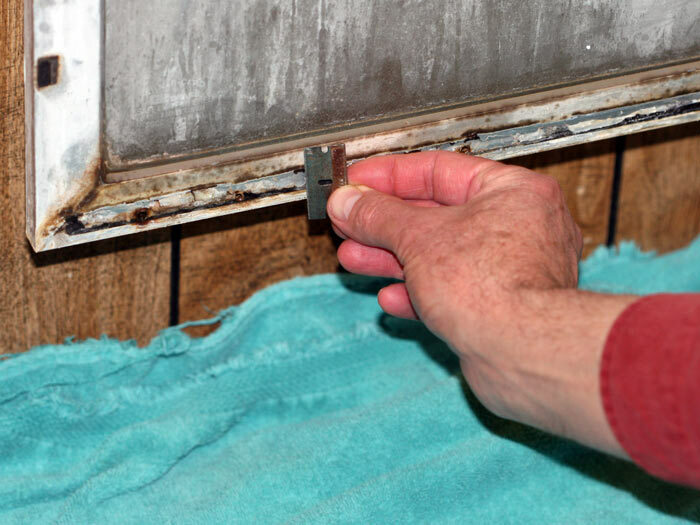 We next removed the old and rusted sheet metal screws that hold on the drip rail/channel. It does look bad, but remember EDFRED is on our side. They vinyl strip was about 1 1/2 inches wide and about two feet long. It was pulled off showing the residue. And here is why you will need the EDFRED. 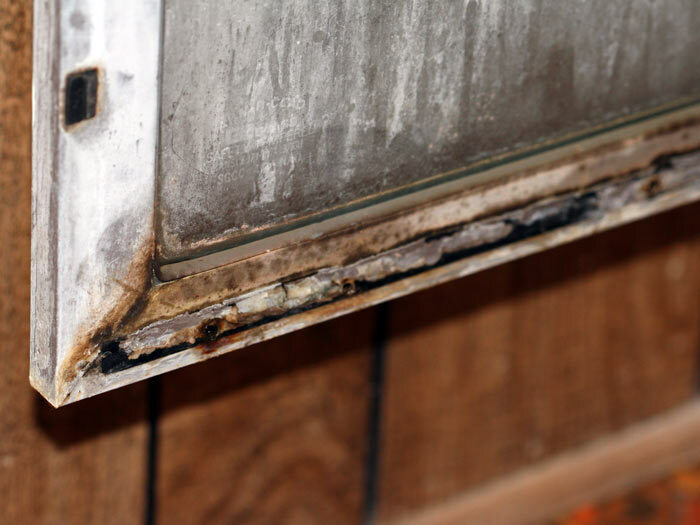 When rust stains are on a rough surface no amount of scrubbing will reach into the depressions. Step 3. 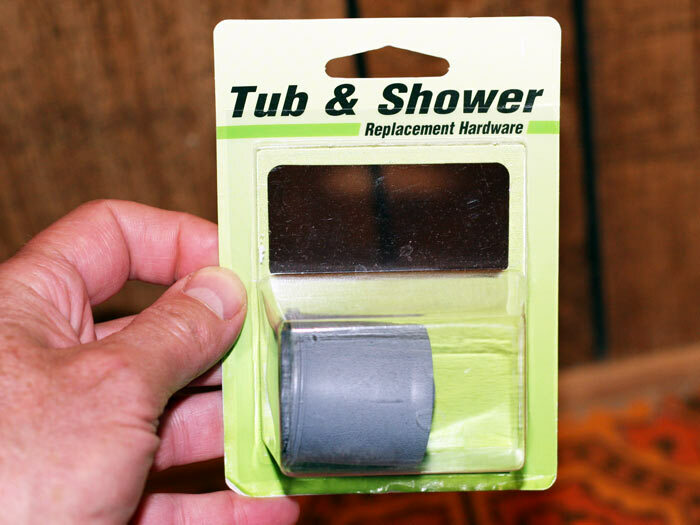 Go to the hardware store and pick up parts. Take your old parts with you. We needed replacement screws and a small roll of vinyl seal. 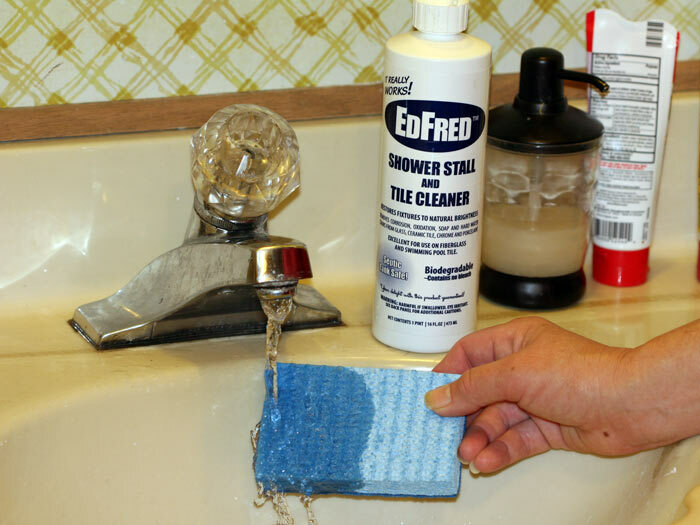 Don’t forget a bottle of EDFRED Stall & Tile Cleaner. At Orchard Supply Hardware it is item #1078112. Ace Hardware is item#19575, or online at www.edfredstore.com. Some advise not to use abrasive sponges on shower doors, but we found the blue sponge abrasive level no problem for this door. Step 4. Let’s clean this up so we can see what we are doing. Put down a towel under the shower door. 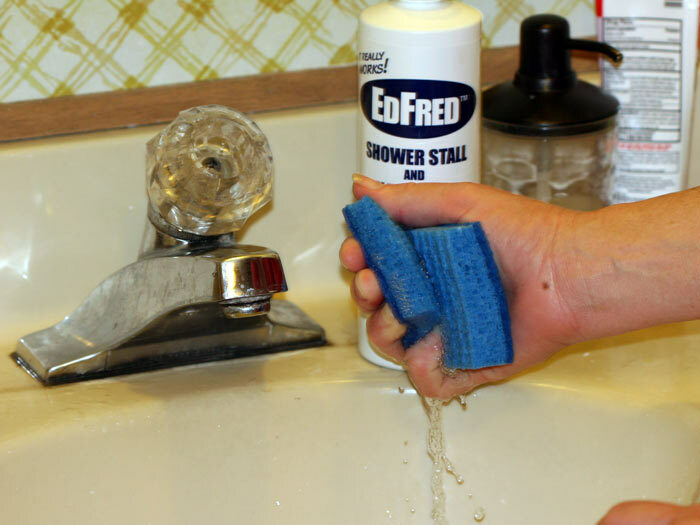 Wet a sponge, squeeze out the excess and load it with EDFRED Shower Stall & Tile Cleaner. Why wet it? 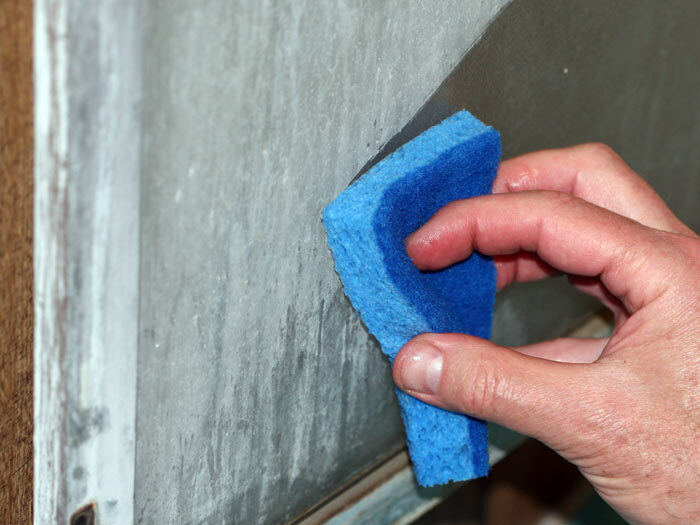 If you load the pores of the sponge with water first you will use less cleaner! Load it up generously with some of you new best friend. That's not enough! Load it up! 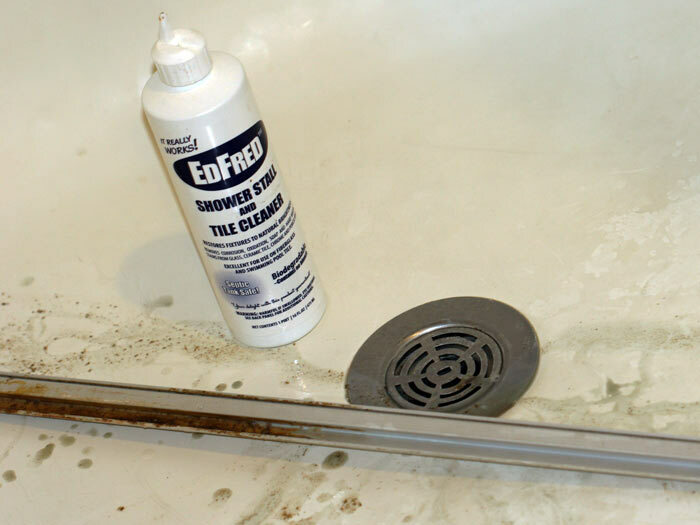 If there is any glue on the parts, carefully scrape with your razor blade before applying the cleaner. Start applying evenly and generously, following the directions on the bottle. 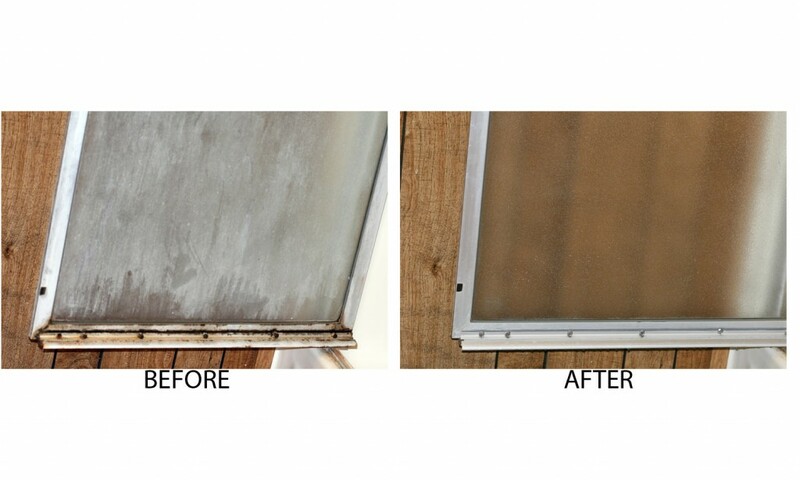 The parts can go into the shower for a good drenching of the cleaner. Might as well clean the glass while we are at it. Remember to follow the directions on the bottle. 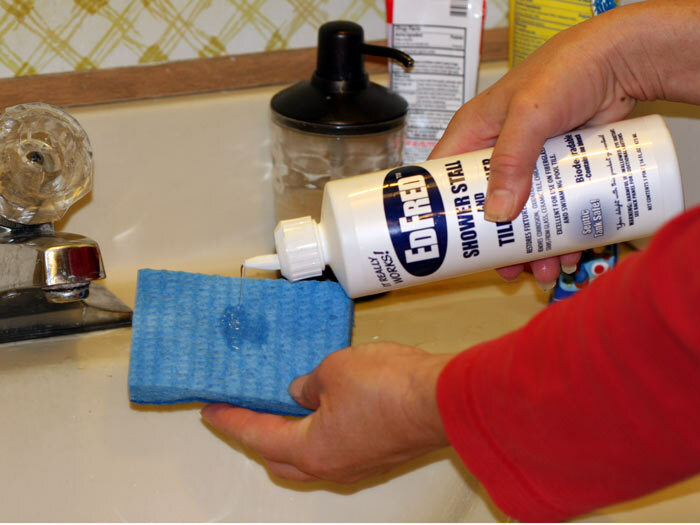 Step 6: Let the Shower Stall & Tile Cleaner remain on the surfaces according to the instructions. Let it do the work. The screw holes were very rust stained, so we applied it twice and let it stay about 15 minutes. Step 8: Rinse off the cleaner. Give it fresh water sponge bath or use the shower head, whatever works for you. Things are looking up! Step 9: Reassemble the parts cutting a replacement piece of vinyl sweep material. Here is the package of vinyl from the hardware store. Use the old one or your measurements to cut a new sweep. See the gray edge of the vinyl strip just above the screws? 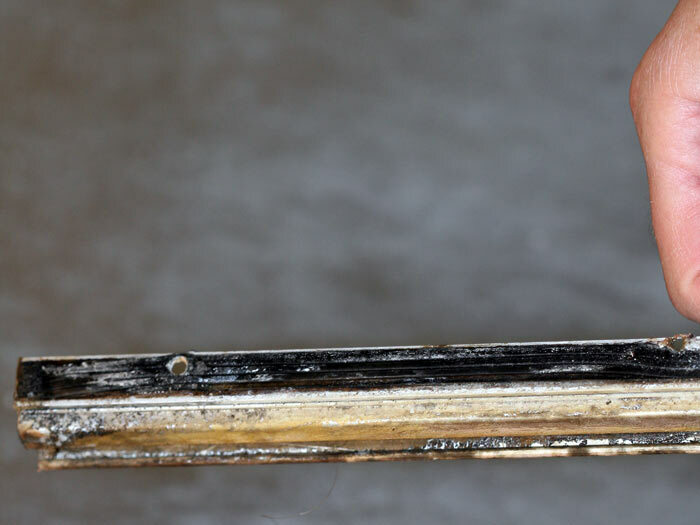 This will shed the water into the rail and leave no groove for scum accumulation. Rust gone too. Sweet! Step 10: Lay on floor and check the fit and clearance of the parts. Check for leaks.